The plot: The last straggling remnants of humanity are sequestered on a weather-resistant super-train after the entire world if frozen over. While the first class passengers live in comfort and luxury, the passengers in the tail of the train are mistreated and live in meager conditions. Led by Curtis (Chris Evans) and Gilliam (John Hurt), the citizens of the tail plan to take control of the train from its mysterious designer and engineer, Wilford (Ed Harris) with the help of drug-addled lock expert Namgoong (Kang-ho Song) and his daughter Yona (Ah-sung Ko). But all is not as it seems on the kaleidoscopic train, as Curtis comes to better understand just how the train and its society are run. During the film’s opening minutes, you’d be excused for believing that Snowpiercer was standard post-apocalyptic sci-fi fare. Exposition in the form of radio broadcasts during the opening credits inform us that the world frozen by mankind’s attempts to fight global-warming. Jackbooted soldiers mistreat a band of scrappy working class passengers as a scowling, beanie-clad Chris Evans plots his coup. The colors are as washed out and dark as the atmosphere. Yet, as will gradually be revealed, this film is far from 1984-on-a-train. Directed by Joon-ho Bong of The Host fame and based on French graphic novel Le Transperceneige, Snowpiercer is anything but standard. Rather, it is one of the most unique and visually striking sci-fi films of recent memory, and easily among the year’s best. 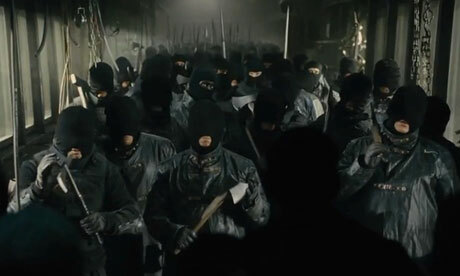 Much like the train itself, Snowpiercer opens up and reveals its true, bizarre colors as the small band of revolutionaries make their way up along the train cars. As the film leaves behind the tail car, it also leaves behind the trappings of standard sci-fi. Evans and his cadre of tail-car allies seem as genuinely surprised at what lies in front of them as the viewer, creating an atmosphere in which anything can happen, each car becoming simultaneously more luxurious and bizarre as the film progresses. Before the journey is over, Curtis and co. will fight hood-adorned axmen, wander through a rave, and sit down to a pleasant sushi lunch (not necessarily in that order). Even during action scenes, Bong is determined to take left turns. During the battle with the aforementioned axe-goons, the battle is momentarily stopped as the goons joyously celebrate as the train crosses a massive bridge, signifying the New Year. It’s clear that Terry Gilliam is a major influence on Bong, a fact that shines through in Snowpiercer (a debt that is perhaps acknowledged in the naming of Hurt’s character, incidentally the architect and mastermind behind the uprising). The film is quirky and disturbing in equal measure in a manner that is similar to 12 Monkeys and other Gilliam films, but this influence does not overshadow Bong’s own vision. Bong and cinematographer Kyung-pyo Hong knock the visuals out of the park, and make Snowpiercer visually original, even when it tips its hat to other directors. Luckily, plot and cinematography are not the only areas in which Snowpiercer defies convention. Chris Evans’ Curtis is far from a standard sci-fi hero. Curtis chafes under the trust and unwavering support afforded by his fellow tail-car passengers, particularly that of his second-in-command and surrogate younger brother Edgar (Jamie Bell), the reason for which we learn as the film progresses. As a leader, Curtis is not the wise and assured revolutionary he seems to be at the film’s opening. Curtis is angered easily and occasionally makes costly decisions that will haunt him through the film. As his companions begin to fall around him, Curtis has pangs of doubt about his mission, to the point where his trek has changed into something much more personal and angry by film’s end. Chris Evans disappears into the role as he makes tough moral choices that distance the actor from his turns as Captain America. Kang-ho Song gives an equally strong performance as Namgoong, whose drug-induced mania hides a complexity that comes into play in the film’s final act. The strong performances by the lead actors, however, make some of the supporting characters seem lacking in comparison. All involved give stellar performances, but the roles themselves are perhaps underwritten. Octavia Spencer as a woman accompanying Curtis on his mission as she searches for her son is portrayed as a strong character capable of fighting as well as any of the male leads, a refreshing character that is underutilized in the film. This kind of character is still rare in mainstream sci-fi and it would have been nice to see her get more screen time. Ewen Brenmer plays a virtually identical role to Spencer as Andrew, a man looking for his son. There isn’t much to distinguish their arcs from each other, and as result, when his character is killed (oops spoiler), it doesn’t have the impact it should. Similarly, John Hurt as Gilliam is tailor-made for the role of “quirky old sci-fi movie mentor” and plays it well, yet most of what we learn about the character comes from other characters’ dialogue and not from Hurt’s performance. Tilda Swinton (who apparently went to the same School of Menacing, Hard To Place Accents as Jodie Foster in Elysium) gives a sometimes-funny-sometimes-grating performance as the cowardly second-in command to Wilford. Ed Harris plays an Ed Harris villain. She looks just as disappointed as I am that she’s not in more of this film. Supporting cast depth aside, Snowpiercer is an engaging and wholly unpredictable sci-fi thriller. The film builds upon the conventions of the genre only as far as it needs to so to break away from them. The film’s early heavy-handed imagery—they want control of the train to literally change the course of humanity. Get it guys?— and unexplained plot elements (a henchmen that comes back from the dead for seemingly no reason) gives way to a film that is truly unlike anything else. Snowpiercer is tense, imaginative sci-fi, and really, what more could you want from the genre? 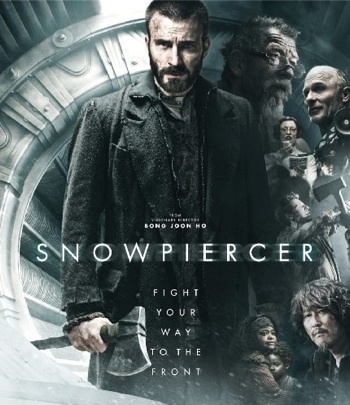 Look for Snowpiercer in limited theater release, VOD, and iTunes. Thanks for posting, great to read.